Over the last couple months, I’ve been overdoing it physically, staying up too late, and eating too much junk food. My stress levels have been very high with selling a house, moving into an apartment, and the changes these things have brought for both myself and my children. Add in unexpected problems, and this leads to overwhelm!! I’ve come to the conclusion that I really need to do a better job taking care of myself EVERYDAY, and not just when pain and fatigue flare up. So I went to my friend Google looking for inspiration and tips. 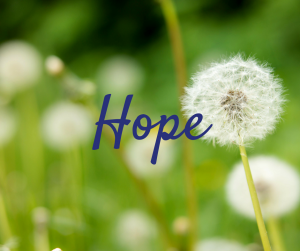 As I thought about the word HOPE and Terri’s plan, I created one of my own. Healthy Diet: Eat one fruit and one salad each day to start with. Increase to 5 fruit/veg servings per day. Make a meal plan each week, and stick to it. Stop eating sugar and wheat. Drink 6-8 glasses of water per day. Prayer and Meditation: First 5 app daily, journaling and artwork 3 x a week. I’m in the process of creating a tracker to help me mark off servings of fruits/veggies, glasses of water consumed and walking in the park with my pooch. Or maybe I’ll just use My Fitness Pal, since I need to lose weight, and it keeps track of what I eat as well. 1. Focus on the present moment. If I would focus on the present, instead of what might happen in the future, or fretting about what has already happened, I would have more energy to deal with a crisis. 2. Listen to your body. This is such a difficult one for me. After a weekend of gastrointestinal upset, I felt so hungry on Tuesday. After a small amount of food my stomach was saying “I’m full,” but my head kept telling me to eat more. I thought “Even my body is confused.” I chose to stop eating and listen to my tummy. Oh, but how many times in July did I overeat due to stress! I didn’t listen to the sensations of fullness and overate anyway. No wonder my gut had enough and revolted. 3. Rest as much and for as long as you need to. Here is another one that I don’t follow. Even when I’m tired I keep playing one more computer game. Or I lay down for a nap and take my phone with me. Then I wonder why my arms and neck are killing me. 4. Tell someone how you are feeling. Most of the time I’m pretty good at this one, though there are times that I keep things to myself. 5. Pamper yourself. I rarely do this, but I have been working on it. For example when I shave my legs, I put Epsom’s Salt in the tub, and fill it a bit with warm water. So I do three things at once- shave, soak, and soften my nails for cutting. By the way, I don’t do this when I’m showering. It’s too much at one time. 6. Don’t beat yourself up about it. Another tip that I have to keep reminding myself about. My energy levels plummet when I’m beating myself up. I am getting better at catching myself, though. 7. Stay hydrated & eat nutrient-rich foods. Do Mounds bars count as nutritious food? Yeah, I didn’t think so. I try to drink enough, because my medications make my mouth dry. In this summer heat though, I sometimes fall behind. This leads me back to Terri’s Self-Care Roadmap. I think these two articles have given me plenty to think about, and do. What about you? 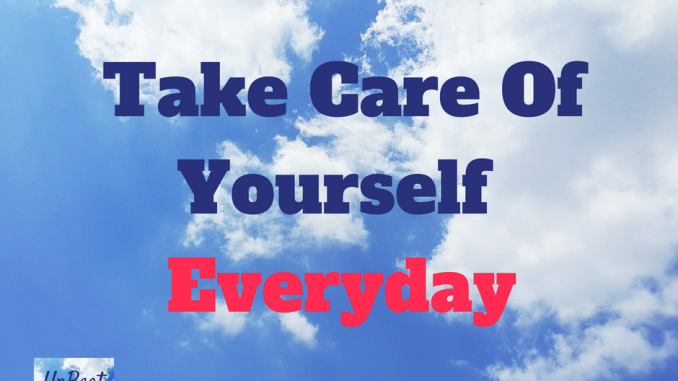 Do you need to do a better job at self-care everyday? Which of these tips or ideas will you add to your day to promote a more stable level of functioning? Don’t forget to take these ideas and make them yours. Not everyone has the same abilities and challenges. Kathy, thanks so much for mentioning my post and blog link! This was a fabulous post, and you’ve done a really great job with your self-care plan! I’m going to check out the First 5 app you talked about. It sounds really interesting. Sharing this on Facebook and Pinterest. Thank you for writing such an encouraging note. You made my day. Thank you also for sharing your roadmap with us. It inspired me.